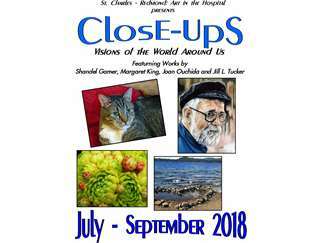 Redmond artists Shandel Gamer, Margaret King, Joan Ouchida and Jill L. Tucker are pleased to present ClosE–UpS: Visions of the World Around Us from July through September 2018, at St. Charles Hospital—Redmond, 1253 NW Canal Blvd., Redmond, OR. Shandel Gamer’s serious interest in art began in high school where she painted her first pastel portrait. Forty-five years have passed since that first painting. In the “ClosE-UpS” exhibition, Shandel celebrates her years as a portraitist and offers the community a view into what she refers to as “the Landscape of the Face.” To see more of Shandel’s work, visit her on the web at www.golemart.com. Margaret King was originally from Huntville, West Virginia, but now lives in Redmond, OR. A former teacher, Margaret only recently took up the camera. Becoming a photographer has given Margaret the freedom to explore all aspects of her creative side. Although she does not have a website (yet), she is always excited to share her photographs with interested parties. Joan Ouchida is a multimedia artist who has worked in one form or another as an artist for over forty years. In addition to her photography, she creates jewelry, functional crafts and three dimensional furniture pieces incorporating upcycled used sports equipment. Most of Joan’s photography features close-ups which offer new insights into everyday subjects. One of her goals in her photography is to give the viewer a new perspective of the ordinary things as they are found around us everyday. To see all of Joan’s varied artworks, visit her on the web at www.ouchidaart.com. Jill Tucker is a retired educator who came to Central Oregon in 2011 with her six cats in tow. Having taken up the camera nearly seven years ago, Jill has moved from a beginner to a talented professional. For this exhibition, Jill elected to bring photographic portraits of her household pets—seven cunning cats. Through these cat portraits, Jill hopes to show the many rather human aspects of a cat’s personality. For more of Jill’s photographs, visit her on the web at www.zhibit.org/jilltuckerphotography. For more information concerning ClosE –UpS: Visions of the World Around Us contact Shandel Gamer at sgamer1955@gmail.com or Joan Ouchida at ouchida@bendcable.com.